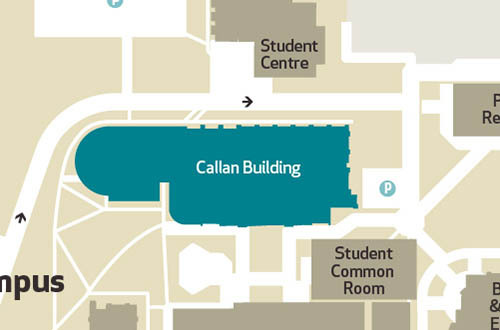 The Deans' Office is located in Room 120 on the first floor of Callan Building on the North Campus of Maynooth University. The Deans’ Office is responsible for the administrative requirements of the Deans of the Faculty of Arts, Celtic Studies and Philosophy, Faculty of Social Sciences and Faculty of Science and Engineering. These three Faculties, comprised of the University’s Academic Departments and Research Institutes, act as advisory bodies to the Academic Council. The Deans’ Office acts as the point of liaison between Academic Departments and University administrative offices in facilitating the processing of routine (e.g., University approval of student admission) and exceptional business requiring deliberation and approval from the University's statutory bodies. The Office is also responsible for establishing and promoting the profile of the Faculties to external audiences. Tá Trí Dhámh san Ollscoil a fheidhmíonn mar chomhlachtaí comhairleacha don Chomhairle Acadúil. Is í Oifig an Déin atá freagrach as na riachtanais riaracháin a bhíonn ag Déan Dhámh Ealaíon, Léinn Cheiltigh agus Fealsúnachta, ag Déan Dhámh Eolaíochtaí Sóisialta agus ag Déan Dhámh Eolaíochta agus Innealtóireachta. Tá an Oifig seo ina pointe teagmhála idir na ranna acadúla agus oifigigh riaracháin na hOllscoile. Freastalaíonn an Oifig ar ghnáthghnó (ceadú mac léinn a fhaomhadh mar shampla) agus ar ghnó eisceachtúil a éilíonn breithniúchán agus faomhadh ó chomhlachtaí reachtúla na hOllscoile. Is í an Oifig seo atá freagrach as próifíl na nDámh a bhunú agus a chur chun cinn i measc an phobail lasmuigh den Ollscoil. Chomh maith leis sin, is iomaí ionad taighde, institiúid agus grúpa atá lonnaithe san Ollscoil.